Save it on your computer for using whenever you'd like! Your health should be your main focus, and these quick stretches are the perfect way to recenter body and mind during a busy work day. 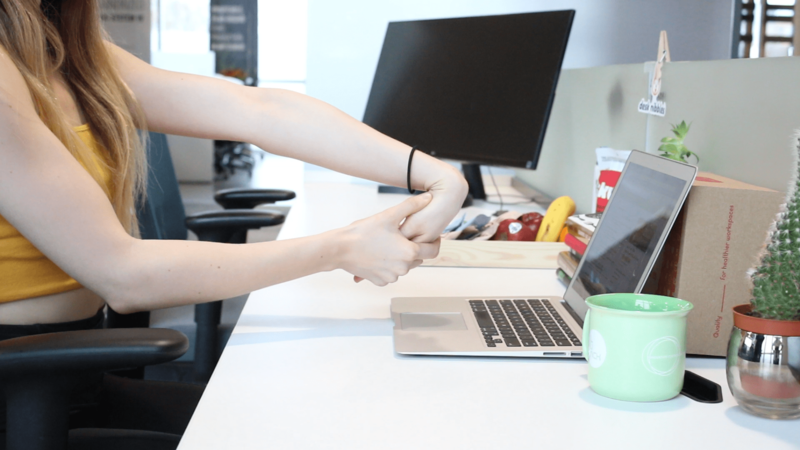 Office aches are no match for this fast and easy routine! Sitting at a desk all day, it’s easy to ignore the warning signs of chronic office aches and pains that gradually build from poor posture, repetitive tasks, and negative body language. Besides your physical health, a sedentary work routine can increase your stress levels and lead to depression and anxiety. 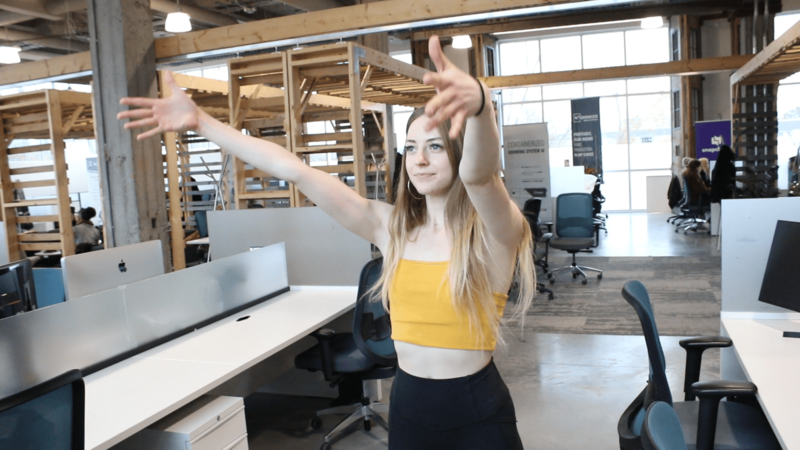 We asked Sylvia Ivy, a certified yoga instructor, to come to our office and show us some techniques. These easy office stretches help ease these aches and explain why a little bit of yoga throughout the day is a first step to a healthier lifestyle. Many of us tend to overlook the fact that sitting at a desk all week is actually pretty uncomfortable to deal with. Spending 40 hours a week hunched over a computer screen is unsurprisingly bad for your health - but why? Sylvia explains that it goes beyond poor posture. Sitting for long hours squashes the lungs and diaphragm, meaning you are taking less oxygen into the body. This pose opens up the diaphragm and lungs while stretching out your back muscles. It’s funny, but most people do forget how to properly breathe! Limiting your full capacity to breathe for 8 hours a day does make a difference, but luckily you can recalibrate with this routine from the comfort of your desk. It’s the #1 spot for tension to build up in the body, as we unconsciously tend to roll our shoulders forward when seated for long periods of time. The neck is also the prime region for harbouring stress and can cause real pain and reduce motion with chronic aches in the office. Contrary to what you might think, this pose can be completed while sitting down - but don’t rush it! Always treat neck rotations with caution as they are prone to hyperextension and muscle compressions. If done safely, these stretches can release the pent up tension in both the upper spine and shoulders. The ultimate bane of the modern employee: carpal tunnel syndrome. Typically brought on by short, repetitive motions of the wrist, carpal tunnel can affect people of all ages and job descriptions and is the must frustrating of offce aches. Whether you spend your days writing or typing, you’re at risk for serious pain if you don’t take proper care of your wrists. The next time you feel a forearm cramp coming on, give this simple stretch a try. For maximum relief, make sure you both pull and press your wrists so that the muscles can extend and compress fully. If you find yourself experiencing the symptoms of carpal tunnel syndrome often then stop working right away to give your wrists time to relax. Consider having an ice pack on stand-by or talking to a doctor if the pain continues. By focusing on these three key areas of the body that sitting causes the most issues for, you can prevent small office aches from turning into big trouble. 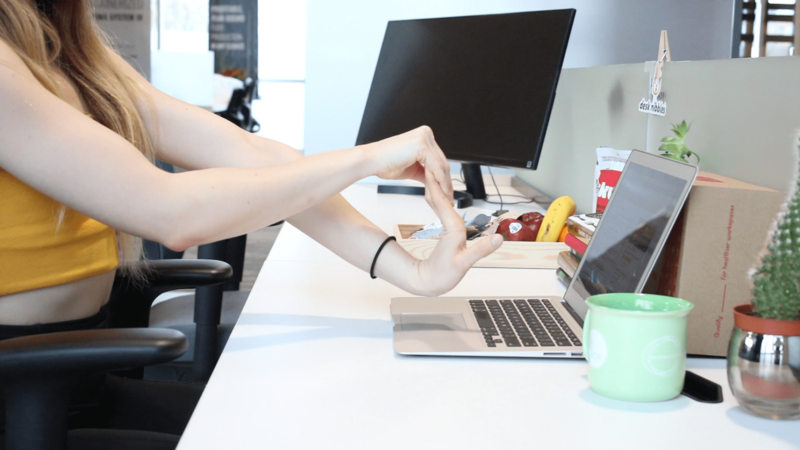 These diaphragm, neck, and wrist stretches are easy to do in the middle of a task, at lunchtime, or even during a snack break! Stretch it out, and happy snacking! Here are the very best (and most surprising) vegan snacks for your office! Check out these 15 unique desk organization ideas even Marie Kondo would love! Want to win Office Boss of the Year? Check out these 12 office gadgets that your employees will love! Use this ultimate list of employee appreciation ideas to recognize the stars in your office! Keeping your business in order can be difficult, but these easy office organization ideas will boost productivity in no time.